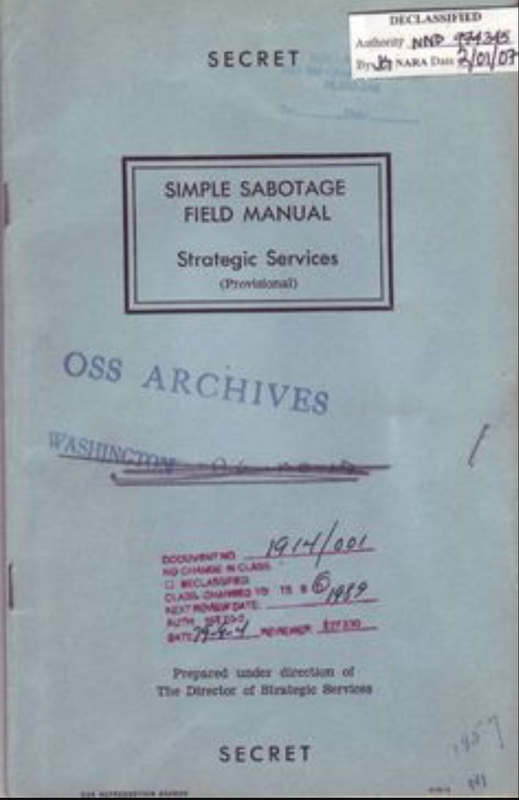 I’m sure none of it was deliberate, but it didn’t half bring this to mind – The Simple Sabotage Field Manual published in 1944 by a CIA predecessor, the OSS (Office of Strategic Services). The manual is packed full of about things you might expect like; disrupting manufacturing, transportation and power production. The usual ‘sabotage’ stuff, putting sand in gear boxes, loosening connectors etc. There were also some fantastically creative sabotage measures like, taking a bag of moths to the cinema to ‘release during propaganda films’, brilliant! Sabotage in the Modern Meeting. Page 28 is where it gets spooky, no clever tools or equipment, just guidance for behaviour in meetings that causes the maximum disruption. 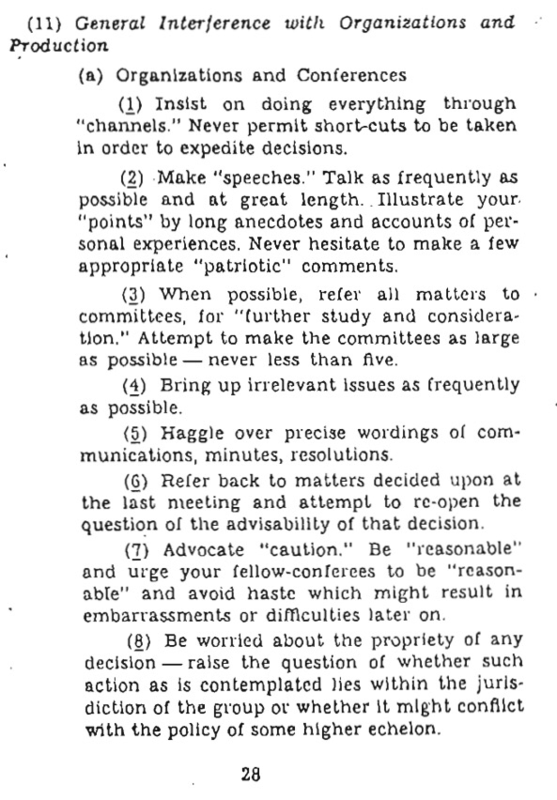 You will have seen this behaviour every day in many places, people applying the instructions written in 1944, to modern-day meetings. Advocate “caution.” Be“reasonable” and urge your fellow-conferees to be “reasonable” and avoid haste which might result in embarrassments or difficulties later on. It leaves me a bit speechless, written in 1944 and still being relentlessly applied by people almost 70 years later. Maybe we should be telling them the war is over. Watch out for saboteurs, they are more highly trained than you think. They might not even know they are doing it (the “let me play devils advocate” merchants are the worst) which makes them really hard to deal with. Deploy a few anti-saboteur techniques. I think I’ll have a go a describing some in the next few posts. This might involve my own ‘Spot the Saboteur’ Checklist. Once you identify them you can start to deploy measures………. I have been to a so many meetings like this, mainly within local government. There was a monthly compulsory meeting that we all dreaded attending. 3 hours minimum and I soon understood why everyone brought emergency rations with them. And I understand that a local community forum, led by councillors is very like this, not even allowed to ask questions, you have to write it down and they decide whether they will address the point you raised. Very democratic. ← Kaizen! Toast v Beer, Who Wins?